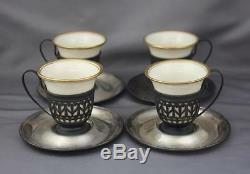 For sale is this set of 4 vintage sterling silver cups and saucers with Lenox porcelain inserts. The saucers measure approximately 3 3/4" in diameter and the cup holders measure 2 1/2" wide at the handle and 2 1/4 tall at the handle. Saucers are monogrammed with the letter M. Please see pictures for more details. There are 24 pictures, half of which can only be seen below the item description section. The item "Set 4 VTG Lenox Sterling Silver Porcelain Demitasse Insert Cup and Saucer" is in sale since Monday, April 17, 2017. This item is in the category "Pottery & Glass\Pottery & China\China & Dinnerware\Lenox". The seller is "wisconsinsilverco" and is located in Saint Paul, Minnesota. This item can be shipped worldwide.